This week we heard from Kenny, D-d-d-danny and Phil Brittan. We responded to questions about God’s anger in Scriptures, Andrew Farley’s treatment of questions that are too tough for him to answer, and the refusal to push, pull and restrain. 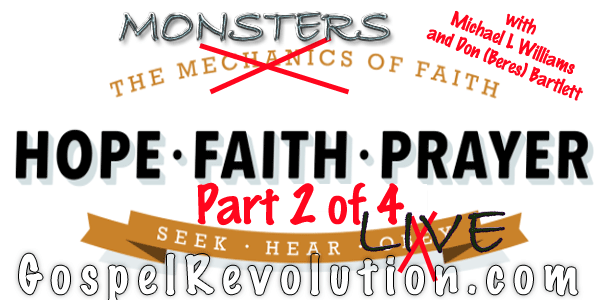 Then we hit our stride in this, the second of a series about how the modern Christian view of faith, prayer and hope denies the Unity of God and man in order to survive. Helen – Great question – we will answer that in the next podcast due out November 10.